Will Egypt's Al-Sisi Steer the AU to Greater Heights After Kagame Reign Ends? 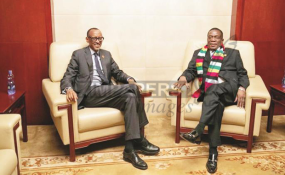 Zimbabwean President Emmerson Mnangagwa, right, chats with outgoing African Union chairman Rwandan President Paul Kagame on the sidelines of the African Union summit in Addis Ababa, Ethiopia. Addis Ababa — THE 32nd Ordinary Session of the African Union Assembly kicked off yesterday with President Mnangagwa challenging member states to equally share the burden of funding the continental body and wean it off the donor dependency syndrome. The Head of State and Government and Commander-in-Chief of the Zimbabwe Defence Forces also bemoaned reports of mismanagement of resources at the continental body, suggesting stiff punishment for offenders. President Mnangagwa made a strong case for the reform of organs of the organisation to make them relevant to the tasks they were established for, while he also urged the rationalisation of the work among Regional Economic Communities (RECs) and other continental bodies with the AU. He was addressing the AU Assembly on institutional reforms of the Union during the closed door session. "Funding remains a major constraint that we face as a Union, which must be a priority in the reform process. It is imperative that member states share the financial burden of our Union through the timeous payment of dues. Let us wean ourselves from the donor dependency syndrome and strive to fund our own agenda, programmes and activities in line with the decision taken in June in Johannesburg, South Africa," said President Mnangagwa. He said Zimbabwe was committed to play its part by timeously meeting its financial obligations to the Union. "I wish to encourage others to do the same. Our commitment and sacrifices for the sustenance of the Union should be matched by the effective and efficient management of resources by the African Union Commission (AUC) and other organs of the Union," added President Mnangagwa. He said reports on abuse of the Union's resources were worrying. "We are therefore gravely concerned by reports of gross mismanagement of the resources of the Union by some of our organs. It is my fervent hope that all the necessary measures will be put in place to end this unfortunate situation," said President Mnangagwa. He urged transparency and accountability. "To that end, we expect that the financial administration and human resources reforms currently underway will be expedited. Accountability, transparency and financial prudence within our organs is a must and not an option. As we agreed at the 11th Extraordinary Summit last November, there should be dire consequences for those who violate existing rules and regulations," said President Mnangagwa. He urged the reform of other AU organs to make them fit for the purpose there were established. "As we vigorously pursue the reform of the AUC, we should not forget the reforms of other organs of the Union, to make them fit for the purpose. To this end, the reform of the Pan African Parliament; the African Commission on Human and People's Rights; the African Union Advisory Board on Corruption; the African Committee of Experts on Rights and Welfare of the Child, among others, should be completed without delay," said President Mnangagwa. "The discussion regarding the division of labour between the AU, the Regional Economic Communities and other continental bodies should be finalised. This will help harmonise the agenda of the AU and that of other associate organisations, in line with the principle of subsidiarity, complementarity and comparative advantage." The 32nd Session of the Assembly of Heads of State and Government was officially opened by Rwandan President Paul Kagame, who later handed over the chairmanship of the African Union to Egyptian leader Abdel Fattah el-Sisi.